It is April, and I am trucking on, gradually getting used to the most recent of life’s inevitable stages. The months turn over like leaves on a calendar: prosaic, inexorable, consequential. Surviving high school. Blossoming in college. The picaresque twenties. Marriage, kids. The succession of houses and jobs, each a little more substantial than the last. Another marriage. Book after book. Frequent flier miles. Happiness with Linda in a new place in the midst of peasants and scholars, displaced activists and rooted generations with the same last names; good people, warm and accepting, all of whom have somehow become my people. And now, loss. sobra la mitad. is too large by half. While the impact of loss is at times overwhelming, it is intermittent. The Santa Cruz / San Pablo communities have been very supporting, and I’ve been invited in to eat, and out to eat, often enough that I am eager to shed a couple of newly acquired kilos. I had a crowd to our house for the Super Bowl. I am still using the plural pronoun - our - but now it seems to denote me and Qalba. I breakfast a couple of times a week with my “adopted” family at the Mercadito, joking with Lupita and Chris and doña Irene, or reading a picture book to Oliver. We all celebrated Candelaria there together on February 2. Other days I’ve gone with groups of friends to Alebrijs games (soccer: we won), Guerreros games (baseball: we won), and simulcasts (live opera from the Met in Oaxaca’s Baroque Teatro Macedonio Alcalá: they always win). The social life has left me barely enough down time to wrap up the Living in Silverado manuscript to send off to the publisher (which I have finally managed to do; it should be out this summer). The principal reason is that I have been blessed with a steady stream of visitors to squire around some of my favorite Oaxacan haunts. My magnificent son-in-law Matt and his wife Abby were here over the New Year. Not only were they enormously helpful in assisting me with the intricacies of paperwork and the labyrinths of computer operations, we were able to visit places like Reyes Etla, with its unexcavated ancient city. The mounds on either side of Abby and Matt are pyramids. I took Andrée Brooks and her friend Nick there too, to traipse around with Qalba in the early morning and admire its colonial church, carved stelae, and views of the surrounding mountains. We also shared an afternoon at Zaachila, one of Oaxaca’s most colorful Zapotec markets, in the company of Hillary Latham, a graduate-student anthropologist with a Fulbright grant with whom I’ve been able to share a number of excursions and from whom I am learning a lot about her research site in Mitla. 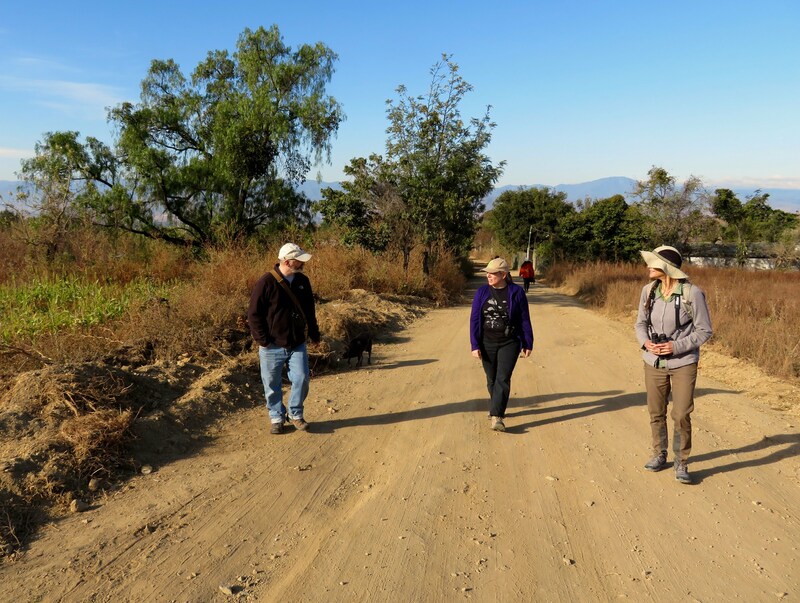 On an excursion that I co-guided to a mining community up in the Sierra de Juárez I met a young woman (young being any person the first digit of whose age is lower than 7) named Linda Saul, a retired geologist from Montana, who happens to be a knowledgeable and enthusiastic birder. So, there you go, another set of early morning hikes up into the hills and around the valley as well as a lovely afternoon at the opera. I was beginning to chill out when my email brought a request from another young woman named Cindy Mom (I thought the Mom was a nickname, but it turns out to have been a family last name), a pen-pal friend of Deborah from a dinky coastal village in Alaska who makes her summer living as a birder and guide to scientists on some of the offshore Alaskan islands, and who in the winter goes adventuring. She was stranded in Huatulco when the little homemade sailboat that the captain, his wife, and Cindy were about to sail to the Galapagos put ashore so the captain could have an operation. When she wrote to ask Deborah — “Say, don’t you know somebody in Oaxaca?” — Deborah responded that, well, she was pretty sure that her dad up in the Central Valleys who could show Cindy around. And her dad did. So Cindy Mom, too, made the casita her home for a few days of hiking and birding and touring and sliding before heading back out into the Pacific. No sooner had she departed than Libby and Bob Devoe came down for nine days. Libby and I, you may recall, have shared a long term project r, raising our two daughters Deborah and Abby, and she and Bob and Linda and I have visited several times, both here and in Indiana. Now Linda has gone, and Bob is slipping into Alzheimers, but that has not diminished the friendship. Together we hung out, drove into the mountains to see the waterfall at Guacamaya, shopped at the market in Tlacolula, gawked at the gorgeous church at Tlacochohuaya, surfeited ourselves on mole, and went to the opera. By the way, two weeks after they left Oaxaca I visited them again in Indiana. I traveled first to my Rhode Island liver-in-laws Dan and Jean Carpenter Island, then to Boston for my annual liver-tune up (all systems AOK at this 10th anniversary of the translplant). Abby drove east in the CRV, and together we transported the few remnants of my USA material possessions to Indiana, where Abby’s “Sheddio” has become my new permanent address, as my new Indiana driver’s license and voter registration so certify. Consider me one more drop of blue in the Red Sea of the Midwest. Back in Oaxaca late on a Monday night, Brother John and his wife Pat Lee flew in on Tuesday afternoon, Pat for a week of chilling out and shipping, John for two weeks of chilling out and exploring. More good food, more visits here and there, and lots of sharing of this and that as families do. It was nice to see them —actually, it was nice to see ALL of them— and I hope they will ALL come back soon. Just not all at once. At comfortable intervals, in between the other visitors I am hoping to see this summer as I am tiptoeing into the next book project . . . . So all in all, I am getting by with a little help from my friends. My outlook is positive and my spirits are good. I, and I think Linda, wouldn’t have it any other way.